We are a full-service real estate firm consisting of a group of talented individuals ready to assist you whether you are buying or selling a home. Let us make your home buying or selling transaction as stress-free as possible. 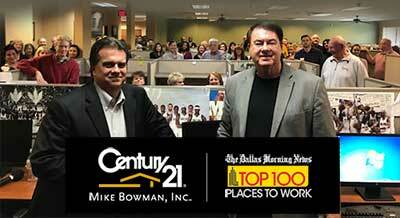 Maybe that is why CENTURY 21 Mike Bowman, Inc.’s office has sold more homes the last 46 years in Tarrant County than any other office.